Vieques Island lies seven miles east of Puerto Rico and can easily be reached by small plane from the San Juan International airport, the nearby Isla Grande airport or from Ceiba. Ferries to Vieques from Ceiba are a bit more complicated ( see ferry schedule below). The various wildlife reserves occupy almost 3/4 of the island and offer an amazing variety of beaches. Rent a car and explore a different beach each day! Ferries land in Isabel Segunda, the only real town in Vieques. From Isabel you can walk to a small guest house or taxi across the island to Esperanza or to one of the many countryside inns. Esperanza has myriad guest houses, ranging from the fancy El Block to the hostels. Esperanza is 'the strip' lined with restaurants and shops, right on the lovely waterfront. There are no traffic lights in Vieques, but be sure to stop for the freely roaming horses, you never know when a small herd will bolt across the street! A unique attraction is the worlds' brightest Bioluminescent lagoon, best seen on moonless nights.. be sure to reserve in advance. The crystal clear, very clean blue waters and white sands of the beaches are amongst the most beautiful of any Caribbean island and less crowded than most. Getting to Vieques FERRY SCHEDULE . Lately the ferry schedule changes so much that I can't post it anymore, sorry. Vieques is best known for having the brightest biobay in the world. Vieques has no transportation back to mainland Puerto Rico after 6 PM so in order to see the biobay one must either stay the night or do a private charter. 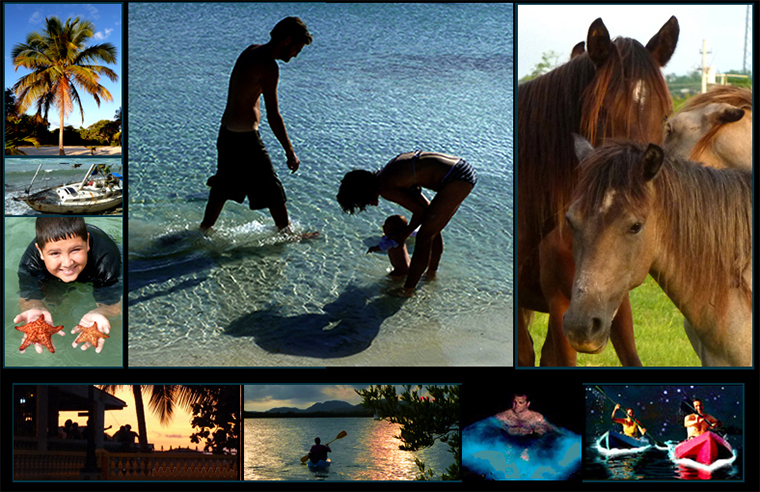 Attractions center around the Vieques beaches and the worlds most brilliant bioluminescent bay. Many great restaurants have opened in recent years. Vieques has quickly become gentrified since the Navy left the island.. Stuck in San Juan overnight?  Vieques Air Link For Reservations cal tel. 1-888-901-9247 or in Vieques: 787-741-8331. VAL has the most flights and offers the most service. LAST flight leaves Vieques back to PR at 5:30! 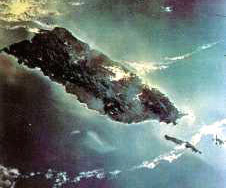 RT to Vieques from Ceiba $45. and from Isla Grande Airport $85. You are allowed only 30 lbs of luggage! Additional luggage $1. per pound. • Seaborne Airlines 1-877-772-1005 or 787-292-6656. www.seaborneairlines.com. Flights to Vieques from San Juan International Airport. • Cape Air is connected to the airlines computer booking service so that you can ticket and reserve from anywhere in the world and check your bags through to Vieques once the commence to operate. 800-352-0714. 787-741-7734. Fly from the nearby Isla Grande Airport in San Juan to Vieques or from Ceiba.
" The Vieques Conservation & Historical Trust is a non-profit organization founded in 1984 and supported by members of the community and interested donors from around the world. It operates thanks to the efforts of dedicated volunteers and is strictly non-political in nature. The organization is concerned with the protection of the unique archeological, physical and ecological environment existing on Vieques."  Fort and Museum 'Conde de Mirasol' T. 1717 Open Wednesday through Saturday. 10 AM to 4 PM.  Groceries: There are two main grocery stores on Vieques ( both owned by Morales brothers) and a collection of 'Colmados'. You can purchase anything here on Vieques, on occasion, but not everything all the time. Grocery store hours are 7 AM to 6 - 7 PM, half day on Sundays. Colmados stay open a little later. There is also a, very enterprising, fruit stand on the side of the road. • Health Food Store is located in Isabel Segunda behind the post office on side street. Paso Finos Shows are a big event in Vieques. . Weekends in Esperanza the streets are over run with everyone showing off on their horses.  Isabel Segunda- The main town on Vieques: two banks, and one ATM at Banco Popular. The Post Office, drug stores, 5 restaurants, a few places to stay and some shops. Please note that Vieques is part of the US and uses the American dollar.